This is the 5th in a series of 9 articles on Potsdam's early history prepared by Marguerite Gurley Chapman, president of the Potsdam Public Museum Association. These articles are being published through the cooperation of Mrs. Chapman and the Museum board. A complete history is available at the Public Museum in a brochure, "The Early History of Potsdam," by Mrs. Chapman, by Marguerite Gurley-Chapman. 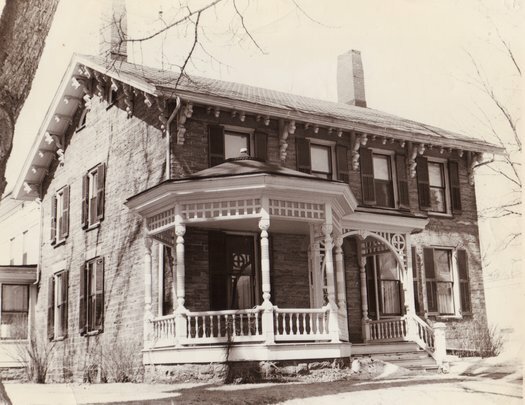 MATTHEW SMALL HOME at 77 Market St., was built sometime prior to 1833 by Azel Lyman. Lyman resided here prior to organizing the Lyman Exodus in 1833 and moving to Illinois. The frame addition to the Small residence is believed to have been added a few years later by Luke Usher, another of Potsdam's prominent citizen's during the last century. To understand the significance of the Lyman Exodus from Potsdam in 1833 it is necessary to give a bit of the early history of Potsdam. Potsdam had been settled by Benjamin Raymond and a few other families in 1803-4. In March 1810, Azel Lyman (born Aug. 1, 1784) moved with his family from Vermont. There was no church in Potsdam but Benjamin Raymond held services every Sunday in his own home for his family. THESE SERVICES consisted of singing and Raymond read a sermon of which it is recorded he had a large collection. Azel Lyman asked Raymond to allow his family to worship with them and the request was granted. The academy was built in 1810 and religious services were held in it on Sundays. On Aug. 14, 1811, St. Paul's church society was formed with Liberty Knowles, Joseph P. Raymond and Azel Lyman, trustees. Incidentally the first service held in the church academy was the funeral of the first child of the Azel Lymans. EXCEPTIONS having been taken to the name of St. Paul's society, it was, on Dec. 16, 1820, changed to the First Presbyterian society in Potsdam with Azel Lyman, Sewall Raymond and Forest Morgan, trustees. The first Presbyterian church was built in 1820 at a cost of $4,500 and dedicated in 1822. This location was on the east side of the village park on Academy St. midway between Elm and Main Streets. Three years later in 1825, the new North building of St. Lawrence academy was built next to the Presbyterian church. Lyman also was one of the first trustees of the Academy. IN 1820 and again in the fall and winter of 1826-7 were periods of unusual religious interest and the number of the members was largely increased. More than 120 members were added to the church. The minister, Rev. O. P. Hoyt, was a young man, 26, who had been teaching but a few months yet managed with great wisdom and understanding the great and glorious revival. Meanwhile Lyman's wife, Roxana Fiske, who had come with him from Vermont and two of their children had died and were buried in the cemetery at the foot of Willow St. Later, when this cemetery was abandoned to make way for the new railroad which was to be put through Potsdam, these bodies were moved to Bayside and are in the single graves just east of Clarkson vault. AZEL LYMAN married Mary Bates, his second wife, in 1830. The Lymans lived in the beautiful stone house on Market St. now owned by Matthew Small. He built the stone building on Willow St. for his tannery and had a leather store on Market St. where the new W. T. Grant store now stands. 1. Dr. John Lyman, born April 2, 1780, 53. He was Azel's elder brother who had come to Potsdam in 1824, the year Dr. Robert McChesney died at the age of 34. Dr. Lyman was prominent member of the Exodus, being a man of very strong character and took an active part while in Illinois in the first anti-slavery movement and several times came near being captured while engaged in the under ground railroad work. Later in life he became active in business. He was a very earnest Christian and gave freely to the support and spread of the Gospel. Martha Stoors Lyman, his wife. Children, Henry Pratt Lyman, 28 years old; Benjamin Rush Lyman, 18 years old; Martha Lyman, 16 years old, and Laura Lyman, 14 years old. 2. Deacon Azel Lyman, 49, (born Aug. 1, 1784). His first wife was Roxanna Fisk, born 1788, died June 7, 1829. Children by first wife, Azel Stoors Lyman, 18; Roxanna Fisk Lyman, 14; Mary Calista Lyman 9; by second wife, Ellen Elizabeth Lyman, 2, and Emily Eliza Lyman, 5 months. 3. Alvin Lyman, 46, (bom March 16, 1787, died Oct. 6, 1865) Sangamon County, Ill. Lucy Perrin, his wife, of Royalton, Vt.
4. Ezra Lyman, 44, (born Feb.23, 1789 died Oct. 1, 1855). Mary Cushman of Brookfield, Vt., his wife. Children, Ezra Cushman Lyman, 19, Mercy S. Lyman, 13, and Zerniah H. Lyman, 3. 5. Cornelius F. Lyman, 41. Betsy Cushman, his wife. Children, Cornelius Stoors Lyman, 18, and David P. Lyman, 11. 6. Henry Pratt Lyman. 28, son of Dr. John Lyman. Mercy Sanders, his wife. 7. Stephen Childs. Hannah Lyman, his wife, daughter of Dr. John Lyman. Children, John Childs, Mary Childs and Martha Childs (not born until Christmas, 1833, in Illinois). 8. Oliver Bates, his wife and child, Rozanna Bates. 9. James Bates, brother of Oliver and Peter Bates. 10. Luther Ransom, his wife, children, Henry Ransom, and Elizabeth Ransom. His sister, Amanda Ransom. Doran Ransom, Jeremiah Low. 11. Charles Watts from Brasher, his wife, child, Alexander Watts. 12. Haraldus E. Tabrook from Hull, Que., his wife, children, Able Estabrook, Eliza Estabrook, Sophia Estabrook, Mary Ann Estabrook, George Estabrook and Harriet Estabrook. 13. William Purcell a bound-boy, 13 years old, in the Estabrook family. Azel Lyman sold all his property in Potsdam and made arrangements for the journey to Illinois. The canvas covered wagon train formed on Market St. in front of the Knowles homestead (where the A & P store is now) on the morning of Aug. 22, 1833, and numbered in all, 52 souls. "I will try and give you as correct an account of the Lyman Exodus as my memory will permit. Seventy years ago today we were moving along to Illinois. We had a camp meeting every Sunday preaching in a tent. We stopped Saturday noon for the women to wash and bake and to send out word that there would be preaching at 11 o'clock. So you see, we did not forget our God on the road. The trumpet blew at 4 o'clock to get up and blew for breakfast and blew to start on the road. We stopped at noon for dinner and at half past one, the trumpet blew again". "We were nine weeks and one day on the road to Springfield, Sangamon county, Ill., where most of us wintered and formed a church, preaching every Sabbath. As far as I know there are but six of that company living. Nearly all gone to try the realities of Eternity. Your brother in Christ, William Purcell". "WE ARRIVED in Sangamon county Oct. 25, 1833, entered land eight miles west of Springfield. We organized a church of 32 members and also a Temperance Society of 60 members, the first one in Illinois. We furnished five sabbath schools in the county with superintendents, also five teachers for common schools. In 1835 I spent several months selling bibles and circulation tracts. In 1836 I was employed by the American Sunday School Union to labor in the southern half of Illinois organizing Sunday Schools". Sabbath schools, organizing a school if teachers could be engaged; supplying them with library and testaments and then to the next neighborhood. The inhabitants in these 36 counties were, the majority of them, poor people from the southern slave states". "MY GREATEST difficulty was to find teachers who could read. No opposition to Sunday schools except from a few Southern Baptist preachers. They invariably opposed Sunday schools and Temperence Society. The colony that came to Illinois from the church of Potsdam was instrumental in promoting not only Sunday schools but revival of religion. God has blessed their efforts in rescuing many sinners from eternal death and many from a drunkard's grave. To God be all the glory". "More than 100 Sunday schools have been organized through their instrumentality. I do not give this little broken history of the colony from the Potsdam church who emigrated to Illinois from personal vanity but to show that God has blessed the efforts of that church in building up and extending Christ's Kingdom in the new part of the country". warrant, of Abraham Lincoln who had preceded them by only three years into that immediate locality, Springfield.